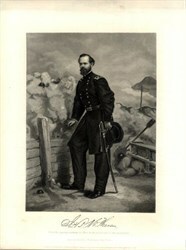 Printed in the 1800's, original engraving ( 8" x 10 1/2 ") by Johnson, Fry & Publisher, New York. This came from the Herzog and Co. / R.M. Smythe archives when they were relocating their offices in Manhattan. This engraving would look terrific framed.